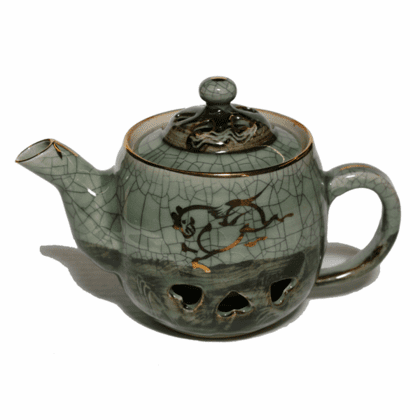 Ceramic Somayaki teapot matches all other Somayaki items we sell. Has double wall construction and gold leaf painted horses on two sides. Comes in the classic two tone green color. 4 inches in diameter and 5-1/2 inches tall. Holds 12 ounces. Comes with a built-in strainer in the tea spout.